Hot-air ballooning is one of the least polluting forms of flying – and one of the safest – so the appeal of taking a balloon safari as part of an eco-holiday is pretty clear and there are few things to beat meeting the dawn from an airborne basket over the African countryside. 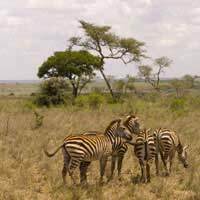 Many companies and tour operators offer these flights as optional excursions on trips to a number of countries in Africa, so if the idea appeals, it should not be too difficult to find one to suit. Ballooning trips are not cheap. The operator’s costs in servicing, recovery and keeping the thing in the air – not to mention buying it in the first place – makes a ticket to fly fairly expensive, especially when you consider that the trip typically last under two hours. However, when you add in the luxuries, such as champagne breakfasts and attentive customer service that usually accompany these flights, together with the unique perspective on wildlife they offer, it’s not really so much to pay for such a once-in-a-lifetime experience. Ballooning safaris are suitable for most ages – the only real requirements being the ability to stand for the duration and to clamber in and out of the basket, although the individual operators will be able to advise you about any particular requirements they may have. Flights take place in the early morning to make the best of the conditions; balloons fly best when there are few thermals and the air stable; as the sun rises and the day heats up, thermals get stronger and the winds usually freshen, making things less suitable. Since you will be taking off in the chill of the early morning, you will need to wear something warm – a few layers being best, allowing you to adjust what you are wearing as it gets warmer. Footwear needs to be “practical” and comfortable enough for you to be able stand in for a couple of hours. These flights can also give you some of the best opportunities for photographing wildlife as you drift silently over the treetops – so do remember to bring your camera – and a good supply of films, tapes or batteries as necessary. The balloons used vary in size, so you may be sharing with between three and seventeen other people – but there can surely be few better ways of getting to know like-minded friends than spending two-hours in a basket with them! Many of the most popular safari destinations offer the possibility of ballooning trips, including Tanzania, Botswana and Kenya, together with South Africa – where, particularly around North West Province and Western Gauteng, the weather is said to be amongst some of the best and most reliable for ballooning to be found anywhere in the world. Wherever you decide to visit, it is important to make sure that whichever balloon company you choose is fully insured, has qualified pilots and complies with all the necessary licence and safety requirements. The best way to make sure is always to book through reputable tour operators or travel agents – and while you’re at it, given that this is supposed to be an eco-holiday, ask them to find out about the company’s environmental policies too! There really are few experiences in the world to match the brief roar of the gas burner as you take off into the early morning sky, followed by the silent drift of your trip, floating like thistledown in the wind. Magical enough on its own – but add in the thrill of flying over elephants, lions and giraffes and it becomes something else entirely; while the ticket may be a bit costly, the memories are priceless.